Oster 18-Qt Roaster Oven Just $25! Down From $58! PLUS FREE Shipping! 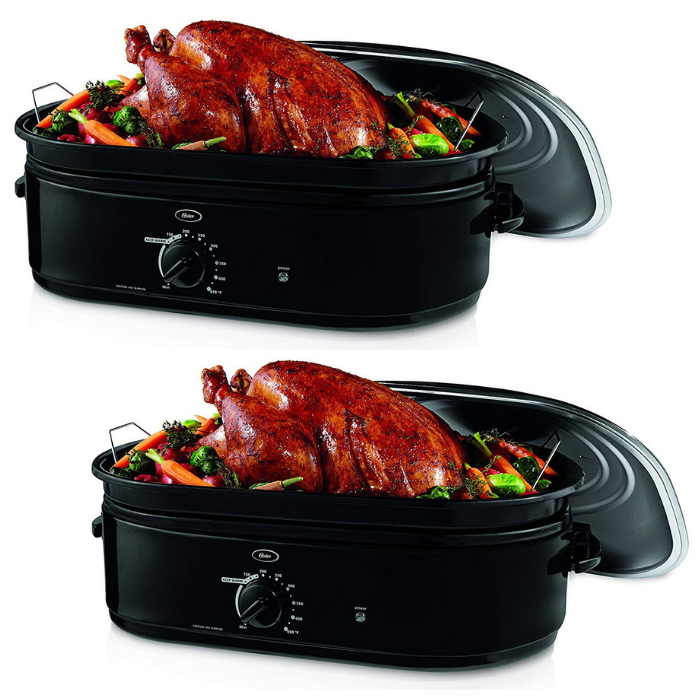 You are here: Home / Great Deals / Amazon Deals / Oster 18-Qt Roaster Oven Just $25! Down From $58! PLUS FREE Shipping! Head over to Amazon to score this Oster 18-Quart Roaster Oven for just $25 down from $58.10 PLUS FREE shipping! Easily prepare everyday meals or your holiday turkey using the Oster 18-Quart Roaster Oven with Self-Basting Lid. Equipped with a self-basting lid, this roaster saves you the tedious task of hand basting over and over again. The 18-quart roaster oven locks in steam from cooking to keep food moist, tender, and flavorful. It seals in heat and intensifies the cooking temperature, helping cut down your cooking time by 30 percent when compared with a conventional oven. This countertop electric roaster also makes your kitchen more efficient by freeing up much needed oven space. The space-saving design with 18-quart capacity accommodates a large turkey weighing up to 22 pounds. The variable temperature control dial lets you set the cooking temperature between 150 and 450 degrees Fahrenheit, while the removable steel rack allows easy access to food. This roaster oven includes a removable enamel-on-steel roasting pan that makes cleanup easy.